We spend a total of 24-hours crammed into Delta coach-class seats. I'm not sure how to capture that experience for you. Arriving in New Zealand, though, made every second of that dark, cramped journey worthwhile. 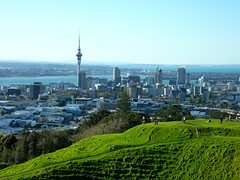 We landed in Auckland on a glorious spring afternoon: crystal clear air … painfully blue skies … and everywhere, the vivid green and bright blossoms of the world coming back to life after winter. Our host, Tony, wasted no time whisking us from the airport to the summit of Mt. Eden. There, after gazing down into the verdant crater of the extinct volcano, we spent several happy minutes staring out at of all of Auckland stretching off in all directions around us. After that, we headed for the Eden Park Bed and Breakfast — our home, here in Auckland — where, after getting us settled in, Tony and his wife Marlene took time to get to know us … and then sent us to their favorite Thai place, Jungle Flavor, for dinner. What a pleasant evening! We strolled to dinner, enjoying the crisp breeze and ducking our heads into bakery after bakery along the way. About fifteen minutes later, we plopped down in our seats at Jungle Flavor. I ordered a huge dish of savory prawns studded with cashews and chopped veggies; Clyde got a whole snapper, fried and topped with a sweet, golden syrup punctuated with flakes of red pepper. Delightful! A walk home under a bright moon … and we slipped under the covers for a long, jet-lag-healing 10-hour nap. Now, here, it's Sunday morning … the light is clear and bright … and we're ready to start our day. We'll spend the morning shopping and wandering the neighborhood … and this afternoon, we're off on a trip to the west coast beaches, the honey farm, the wineries, and the sheep farm. They say I'll get to name one of the new spring lambs. I think I'll call him, "Kebob."